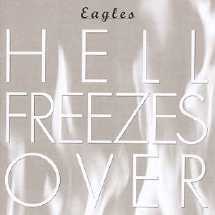 Hell Freezes Over is a live album by the Eagles, released in 1994. The album contains four new studio tracks and eleven tracks recorded live for an MTV special. It went to #1 on the Billboard album chart upon its release where it stayed for two weeks. It is the band's second live album behind their live album in 1980. The Eagles had gotten back together after a 14-year-long break up. Their resumption tour would be given that title after the statement Henley once gave when asked when the band would get back together. The album proved to be as successful as the tour, selling over six million copies and releasing two Top 40 singles in "Get Over It" and "Love Will Keep Us Alive". The band's lineup consisted of the Long Run era, Don Henley, Glenn Frey, Joe Walsh, Don Felder, and Timothy Schmit. The tour would last from 1994 to 1996 and became one of the most successful tours in music history. The album also features an acoustic version of "Hotel California". Hell Freezes Over was also released in video form on VHS, LaserDisc and DVD.